Once upon a time, there was no real distinction between a cocker spaniel and a field spaniel, but today we are two separate breeds. Whereas the cocker spaniel is more well-known as a family pet, I still have more followers in the outdoor crowd, but I make a good family pet also if I can live out where there is a little room to entertain myself and maybe a pond to wade around in. I am a real easy-going type and very patient with kids. When fully grown, I am about 18 inches tall (45.7 centimeters) and I weigh between 35 and 50 pounds (15.8 to 22.5 kilograms). We have no Field Spaniel Breeders listed at this time. 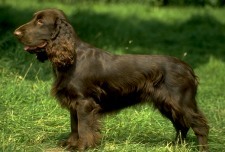 Click here to place your Field Spaniel Ad!